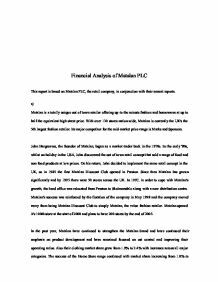 Financial Analysis of Matalan PLC This report is based on Matalan PLC, the retail company, in conjunction with their annual reports. a) Matalan is a totally unique out of town retailer offering up to the minute fashion and homewares at up to half the equivalent high street price. With over 130 stores nation-wide, Matalan is currently the UK's the 5th largest fashion retailer. Its major competitor for the mid-market price range is Marks and Spencers. John Hargreaves, the founder of Matalan, began as a market trader back in the 1970s. In the early '80s, whilst on holiday in the USA, John discovered the out of town retail concept that sold a range of food and non-food products at low prices. On his return, John decided to implement the same retail concept in the UK, so in 1985 the first Matalan Discount Club opened in Preston. Since then Matalan has grown significantly and by 1995 there were 50 stores across the UK. In 1997, in order to cope with Matalan's growth, the head office was relocated from Preston to Skelmersdale along with a new distribution centre. Matalan's success was reinforced by the flotation of the company in May 1998 and the company moved away from being Matalan Discount Club to simply Matalan, the value fashion retailer. Matalan opened it's 100th store at the start of 2000 and plans to have 200 stores by the end of 2005. In the past year, Matalan have continued to strengthen the Matalan brand and have continued their emphasis on product development and have remained focused on cost control and improving their operating ratios. Also their clothing market share grew from 1.9% to 2.4% with increases across all major categories. The success of the Home Store range continued with market share increasing from 1.0% to 1.6%. Meanwhile trials of a number of new initiatives were launched during the year that took the brand into a financial service (Matalan Credit Card) ...read more. This is the basis of accounting prescribed by the companies act, (although the act does allow Alternative Accounting Rules that enable certain assets to be revalued and stated at their revalued amounts). Another example of discretion shown by Matalan is the fact that their assets and liabilities are translated into sterling at rates of exchange ruling at the end of the financial year or where appropriate the rate of exchange fixed under the terms of the relevant transaction. The discretion shown by translating their assets and liabilities at the end of the year. SSAP 20, 'Foreign Currency Translation' does not stipulate a specific time when one has to translate the currencies. However, in accordance with SSAP 20, the all foreign exchange differences are taken to the profit and loss account in the year, which they arise. For Stocks: Stocks, all of which are held for resale, are stated at the lower of cost and net realisable value. Cost is based on a first in, first out basis (FIFO). This is in keeping with SSAP 9, stocks and long term contracts. Definitions: Net realisable value is revenue (sale proceeds) expected to be earned in the future when the goods are sold, less any costs that will be incurred in selling them, (ACCA). Under FIFO, the assumption is made for costing purposes that the first items of stock received are the first items to be sold. Thus every time a sale is made the cost of goods sold is identified as representing the cost of the oldest goods remaining in stock. Closing stock at the end of the period therefore consists of the units purchased most recently. If Matalan were to use LIFO, their closing stock value would have been lower and therefore profit would have be lower Justification: The concept of prudence is used when stock is valued. Stock should not be over-valued, otherwise profits shown will be too high. ...read more. ii) The accuracy of the position shown in the balance sheet. The arrangement of certain matters can be misleading and present a more favourable picture (window dressing), such as ordering goods to be delivered just after the year-end so that stocks and creditors can be kept as low as possible. iii) The accounting ratios of one company must be compared with those of another similar company in order to draw meaningful conclusions. These conclusions will only be valid if that other company's trade is similar. iv) The Chief Executive's outlook may be a bit biased/optimistic, in order to persuade potential investors to invest in the company. Limitations of historical cost accounting: Matalan PLC have based their financial statements on historical cost accounting. Advantages of historical cost accounting include, records are based on objectively verifiable amounts, it is simple and cheap and the profit concept is well understood. A disadvantage is that it overstates profits when prices are rising through inflation. Several factors contribute to this. For example, if assets are maintained at their original cost, depreciation is based on that cost. As inflation pushes prices up, the true value to the business of the use of the asset becomes progressively more than the depreciation charge. This disadvantage can be overcome by revaluing fixed assets. FRS 15 Tangible fixed Assets then requires depreciation to be based on the relevant amount (ACCA, 2001). Other disadvantages include: Maintains financial capital but does not maintain physical capital, the balance sheet does not show value of the business, it provides a poor basis for assessing performance and there is no recognition of the loss suffered through holding monetary assets while prices are rising. 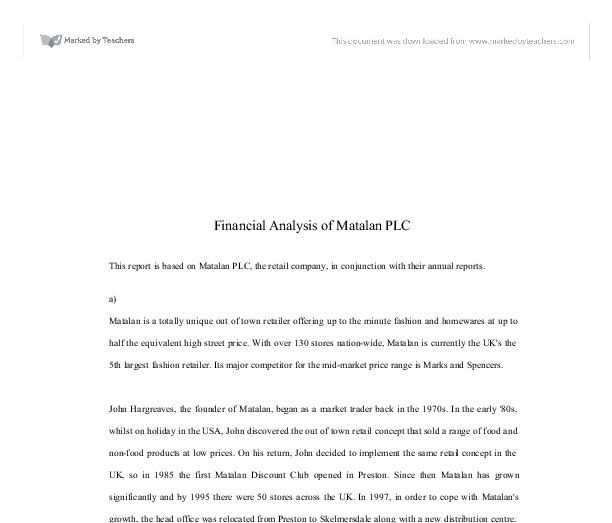 Finally it should be noted that the emphasis on information produced by Matalan's financial statements is financial. In many cases, non-financial data would be useful in order to see a complete picture of the state of the organisation. Non-financial data includes, for example, the number of employees in the organisation and the types of skills they possess, or indicators of efficiency with which the organisation addresses complaints from customers (Lewis and Pendrill, 2001). ...read more. missing out a number by mistake). * In a paper system documents may get lost or be misfiled. This cannot happen in a computerised system. * Access to specific sections of the package can be restricted to designated executives or managers, for security. Disadvantages: - * A mistake can be difficult to correct. Below will show if we raise the selling price to �2.50, when we will meet the break-even: That will show as the black line in graph1. We can also calculate in the equation: Contribution: �2.50- �0.40= �2.1 Break-even: �1 000 000/ �2.1= 476190 That show after increase the selling price, we meet the break-even earlier. orderly sale of an asset, and he had the view that information about current cash equivalents was fundamental to effective decision making. Consistent with this view, Chamber states: Excluding all past prices, there are two prices which could be used to measure the monetary equivalent of any non-monetary good in possession: the buying price and the selling price. development of high-quality IASs and IASs would be acceptable to SEC for offerings and listings by foreign corporations in US markets. 2) Process of movement toward IASs In 1996, SEC released a statement that support IASB to develop an accounting standards that could be used for preparing financial statements used in cross-border offerings. 'accruals' - determines when transactions should be entered in the accounts. Revenue and costs are recognised as they are earned or incurred rather than as money is received or paid. c) 'consistency' - there should be consistency of accounting treatment of like items each year and from one year to the next. Both transactions will be recorded in the accounting period to which they relate. Therefore, the accrual concept makes a distinction between the accrual receipt of cash the right to receive cash as regards revenue and actual payment of cash and obligations to pay cash as regards expenses.